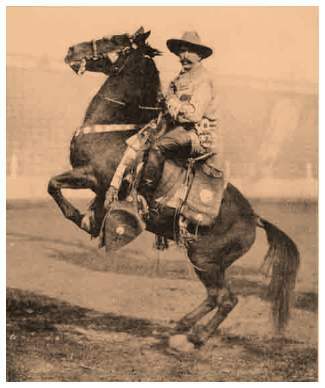 Wild West Show (also referred as: Colonel Cummins’ Wild West Indian Congress and Rough Riders of the World), was one of the most successful of these wild west shows that specialized in showcasing Native Americans. 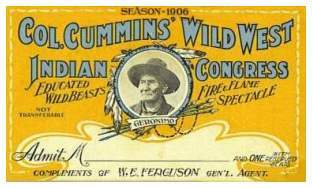 With close connections to the Bureau of Indian affairs, his shows sometimes featured up to fifty different tribes, including such legendaries at one time of another as: Red Cloud, Chief Joseph, the great Apache chief Geronimo, and even Calamity Jane (Martha Jane Canary). Cummins, would would later tour Europe and Australia employed at his Pike attraction, such famous Indian chiefs as: Nez Perce Chief Joseph, American Horse, and Oglala Sioux Chief Redcloud and Seven Rabbits. Over 51 tribes represented and 850 actors, cowboys and Indians were in the Cummins' cast. The show consisted of life on the plains, target and trick shooting, attacking settlers, demonstrations of riding and trick riding mastery, running the gauntlet and lassoing skills. Such western luminaries as" Nanona, Lucille Mulhall, Thomas Johnson and Nebraska Joe & Bounding Fawn, thrilled the crowds with acts of skill, shooting, riding and knife-throwing. Kansas, on horseback in the great Observation Wheel on July 16, 1904. There was a shooting gallery on premises to amuse visitors between shows. appearances, even though he was at another attraction on the Pike. on November 12. This was a free show that did not involve Cummins' attraction. Since the attraction has guns as well as real cowboys and Indians that were not always civil, Cummins banned guns outside of the show. But the Colonel's employees, sometime did not heed this sound advice. Zach Mulhall, father of the famous trick-rider Lucille, shot Reed; no one died, but in the hail of bullets, Reed was injured, as well as another cowboy and an 18 year old spectator who were both shot in the stomach. Mulhall was arrested. Clink this link on a detailed account of Zach Mulhall. At on point during the Fair, there was almost near-riot at the Cummins Wild West Show. It seemed that Humane Society officials tried to arrest some of the cowboys for inhumane treatment of the steers. Both Indians and cowboys attacked the officers. After the scuffle, the crowd poured onto the field of the area to protest the cancellation of the show. Colonel Cummins was arrested that day. On location of this attraction was the ABC Beers Indian Congress Restaurant. As a special presentation, the Custer Massacre at Little Bighorn was recreated on September 15 (St. Louis Day). The part of Custer was played by Cummins himself. Many Indians in the reenactment were present during (and obviously survived), the real battle. The show's finale consisted on a huge battle between the Sioux and their allies and their enemies the Blackfoot (and allies). The American Indians were generally treated and paid the same as `white,' other performers and were able to travel with their families. Yet they were stereotyped as warriors, the last roadblock to civilization and had to fight a losing war nightly. 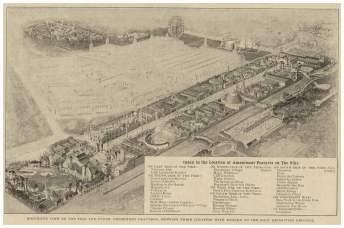 Though the Cummins' Wild West Show's entrance was on the Pike, the arena which could hold 30,000 spectators was outside of the Fair's 'main boundary,' to the north. A ticket from a 1906 show.